I had a bunch of handsome gentlemen in need of a spring hat for the last Passejada amb barret, and decided to start from scratch and design and sew a stylish hat for them. 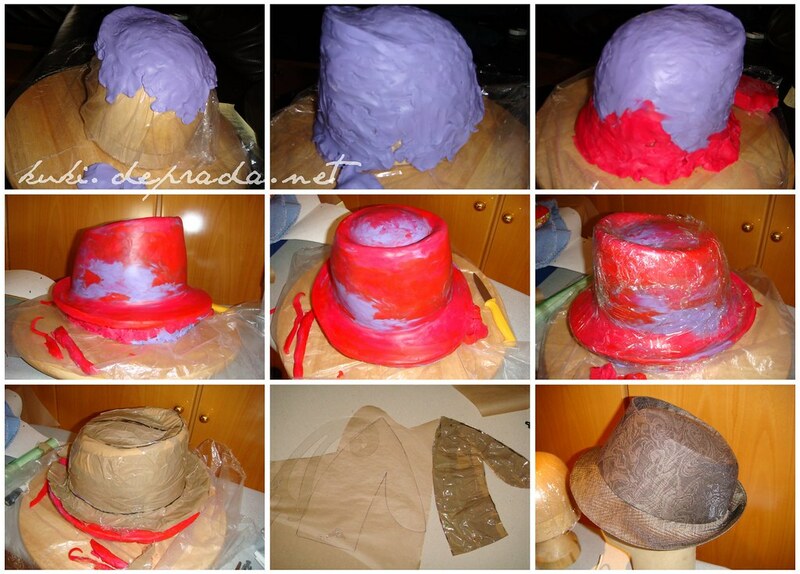 Do you remember that a while ago I sculpted a hat with plasticine and extracted a flat pattern from it? If you don’t remember or want to see it again, follow this link. Well, for my gentleman’s hat I decided to follow the same process. I used a round block as a base in order to save on plasticine (aka Play Doh), and as you can see it starts quite messy and seems hopeless, but little by little it takes shape. I like to smooth it out really well when it’s almost finished. Once the shape is ready I cover it with cling film and ideally I use masking (painters) tape to cover the whole shape, carefully following all the curves. When I made this pattern I was out of masking tape (and it was Sunday, so no hope of finding any) so I used packing tape which is messy and does not adapt as well to the shape, but in the end it did the trick. Then I drew lines with a felt pen where the cuts (seams) were going to be. I think this is the trickiest part of the whole process, trying to visualise where the seams should be, but it’s a process that can be repeated as many times as necessary, covering the form again if we need to, and marking different seam lines. Once happy with the tape pattern it’s time to transfer it to pattern paper and true it up with a french curve. I believe I got really lucky because I love the resulting pattern (the crown is made from one piece of fabric), but I should point out that the finished hat is not exactly as the plasticine version… if you check it out carefully you wil see that I marked the seam to be on the top edge of the sideband, but on the finished hat the top edge is a fold and the seam sinks down. When I had the prototype sewn I saw that it had to sink down, there was no other way. In any case, the pattern still needs some perfecting. The last version is the one being worn by Paco Peralta (my couturier friend, the one on the far left picture), and you can see how the brim curves better than on the other ones (Peter and Joaquín).